Coach Tweit is the third Head Coach in Black Bears history, taking the helm in September 2014. 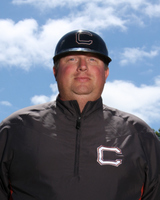 Grady was named Head Coach of the Skagit Valley Cardinals during Summer of 2015, after spending 9 years on the staff at Lower Columbia College. In his first season at Skagit, he led the Cardinals to a 25-19 regular season record, and a share of the NWAC North Division title. As a player, Grady was a standout for LCC, playing an integral part of the 40-5 team in the 1999 and the NWAACC runner- up 2000 squad. He concluded his playing career at York College in Nebraska. It was at York College where he met his wife Alicia. Grady and Alicia have a daughter Mackynlee and a son, Gunnar.